Several years ago I read a five book series entitled the Chronicles of the Kings. It told the story of several of the kings of Israel. The historical fiction helped the story come alive to me. I enjoyed those books so much. I had received this book in the mail before I realized that it was the same author that had written that series. I was truly excited to dive in. 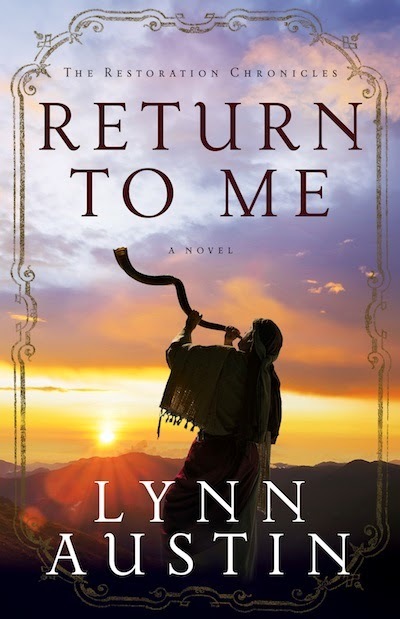 I truly enjoy historical fiction because it helps me put some humanity with the biblical context. You can see the day to day struggle that the people went through. In this case, it was the Jewish people being freed from exile in Babylon and allowed to return and build the temple in Jerusalem. You can see families torn apart. Some left and some were comfortable in Babylon. Some had begun changing to be like their Babylonian neighbors and no longer cared about the things of God. As you read the Biblical narrative, you don't see the length of time of the hardship that accompanied this journey. I had a greater awareness of the danger they were in and the threats they were under from the surrounding Samaritans. The Samaritans wanted to come in and help build the temple. You can see that this would have led to idolatry and political control. This novel gave me a great awareness of how precious God's truth is to be able to hold and learn from. We have truly been entrusted with a precious gift. One thing I appreciated greatly was watching the typical life of a boy who God eventually called to be a prophet. I think it's easy to see a prophet as a man who came out of the womb speaking God's truth, but they were very normal. They were often physically exhausted by the words they spoke. The prophesy spoken during this time gave me chills as I read it again from a fresh perspective. I deeply enjoyed this book. It was graciously provided by Bethany House Publishers fro review.